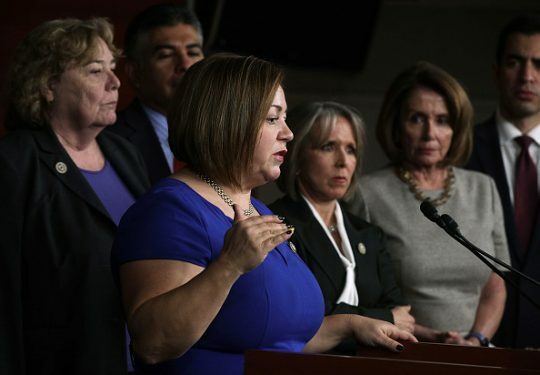 Congressional Hispanic Caucus chairwoman Rep. Michelle Lujan Grisham (D., N.M.) said that the reason the caucus excluded a Hispanic Republican from joining is that the group needs to strategize against the White House. Grisham went on to say that having a Republican would create an environment in which they could not strategize the way they currently do, Business Insider reported. The caucus claims to be bipartisan but does not have any Republican members and has not for two decades. Grisham told reporters that caucus members made the decision "because we have strategies about the White House and we have strategies about those committees and we have strategies about who we are working on and leveraging with and that creates an environment where we stop having strategic discussions." The congressman the caucus refused membership, Rep. Carlos Curbelo (R., Fla.), was rejected for "not sharing the members' values." "The CHC isn't just an organization for Hispanics; it is a Caucus that represents certain values," Grisham said. "This vote reflects the position of many of our members that Rep. Curbelo and his record are not consistent with those values." A spokesperson for Curbelo castigated the caucus in a statement to Business Insider. "While the Congressional Hispanic Caucus continues to play petty partisan games, Congressman Curbelo has already said he would support any DACA solution that comes to the floor," the spokesperson said. The spokesperson, Joanna Rodriguez, added that the caucus promotes segregation of America's Hispanic community. "The Congressional Hispanic Caucus puts partisan politics first and the advancement of Hispanic Americans last," she said. "Congressman Curbelo stated before the Caucus and in multiple statements to media that he was more than willing to sit out of strategic/partisan conversations Democrats wanted to have. Again, the CHC has exposed itself as an organization that embraces discrimination and bigotry and that promotes the segregation of America's Hispanic community." Grisham rejected the idea of changing the name of the caucus to reflect a partisan bent. This entry was posted in Politics and tagged House Democrats. Bookmark the permalink.